In modern societies, electric power is highly reliable for both households and industries. Power companies generate electricity, feed it into their distribution grid, and send it to consumers. Excess electricity cannot be stored, and insufficient electricity leads to brownouts. So, utilities must be very careful to generate electricity at levels that closely match the swings in demand. Today’s centralized power systems are designed to do a good job of this, but they are not designed to reliably distribute electricity generated by decentralized sources, like wind farms or solar facilities. The variability of wind and solar generation is a huge challenge to a renewable energy future. A far greater challenge — the death blow — is the issue of liquid fuels. Liquid fuels are used to power cars, trucks, trains, planes, ships, wars, and our food system. Under perfect conditions, renewable energy might be able to generate ten percent of the energy currently produced by petroleum. Options include ethanol, methanol, and hydrogen fuel cells. Trainer discusses the serious drawbacks. Galileo was a lad who had a powerful talent for thinking outside the box. He was capable of believing what he saw with his own eyes, and rejecting what society told him to believe, if it was nonsense. With his telescope, he could clearly perceive that the sun did not rotate around the Earth. He was alone in comprehending the truth, whilst the rest of society was completely wrong — not fun! Later, as the nightmare of the Industrial Revolution was picking up steam, the mindset of the elite went absolutely manic, soaring in vivid utopian hallucinations. One of those wacky dreamers was the daddy of Thomas Malthus, and dad drove the lad mad. The lad could think outside the box. He commenced to write a book, which explained why perpetual growth was impossible (an atrocious heresy!). For 200 years, the ultra ambitious mob has been tirelessly denouncing the lad who had an amazing ability to understand the obvious. Since World War II, a growing number of heretics have been preaching about limits, carrying capacity, overshoot, and the dangers of ignoring them — folks like Hubbert, Youngquist, Ehrlich, Hardin, and Catton. But few are listening. It’s still a heresy. “Grow or die” remains the law of the land, and no other ideas disturb our cloudy minds. Today’s sermon is about Albert Bartlett and his book, The Essential Exponential. Bartlett was a physics professor who was dumbfounded by the world’s inability to comprehend the dangerous power of exponential growth. Virtually all high school graduates remain blissfully ignorant about the subject, just like most graduates of Ivy League schools. You can see a tornado rip a town to smithereens. But as you bike to work each morning, you cannot see or hear the far more destructive force of exponential growth. It’s like a thousand invisible hurricanes battering the planet, and pounding the future. Linear growth is like adding one marble per week to your collection of ten marbles (10, 11, 12…). The rate of growth is steady. On a graph, linear growth is a straight line. Exponential growth occurs when something is increasing at a constantly growing rate, and the rate increases with each cycle — the way compound interest inflates the balance of your savings account. Population can also grow exponentially. In 1986, the world population grew 1.7 percent, a rate that would double our numbers in 41 years. In 1999, growth had slowed to 1.3 percent, doubling in 53 years — 80 million people were added in 1999. Industrial society has been growing like crazy for 200 years. This was made possible by resources that were once so abundant that they seemed infinite. During the growth surge, few enterprises ran into limits that could not be worked around. This encouraged a mindset that paid little or no attention to limits. Nothing was impossible. Nothing! Leap to full alert whenever you encounter a statement that begins with “At the current rate of consumption….” Bartlett saw an article claiming that, at the current rate of consumption, U.S. coal would last 500 years. While statements like this may technically be correct, they are meaningless when consumption is growing at an exponential rate. He calculated that, at the actual growing rate of consumption, coal would last 46 years — which is far more meaningful information. 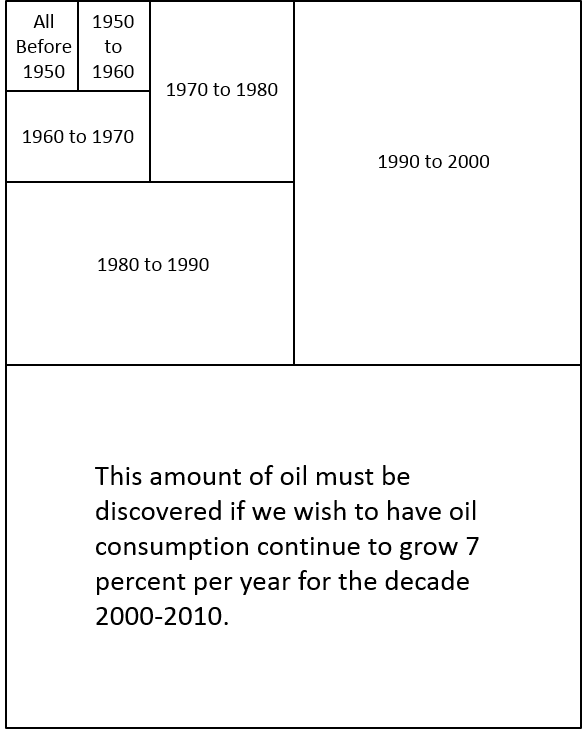 In 1956, Shell Oil geophysicist M. King Hubbert analyzed the trends in oil discoveries and production, and predicted that U.S. petroleum production would peak between 1966 and 1971. Experts called him a dolt. In fact, the peak occurred in 1970. People who understand numbers, like Hubbert and Bartlett, possess powerful magic. When you understand the affects of exponential growth on finite nonrenewable resources, reality becomes spooky. Hubbert produced the following chart to illustrate the era of fossil energy extraction on a 10,000-year timeline. The surge lasts about three centuries, and what follows is sure to be exciting and memorable. “Population growth is not sustainable,” Bartlett insisted. “Can you think of any problem, on any scale, from microscopic to global, whose long-term solution is in any demonstrable way, aided, assisted, or advanced by having larger populations at the local, state, national, or global level?” The worst population deviant was the U.S., because our society consumes resources at an extreme rate. Sustainable growth is an oxymoron. Bartlett carefully explained the original meaning of sustainability — a way of life that must remain stable for millennia. He presented 18 laws relating to sustainability, and 23 hypotheses. He devoted a great deal of thought to sustainability, because it’s an incredibly important concept. Today, genuine sustainability has been rudely pushed aside by the trendy and highly intoxicating silliness of ersatz sustainability, a masterpiece of magical thinking created by shameless marketing hucksters. Bartlett lamented that the herd is convinced “that the frequent use of the adjective ‘sustainable’ is all that is needed to create a sustainable society.” He suffered from an amazing ability to understand the obvious. Bartlett explained the basics of exponential growth in a lecture titled Arithmetic, Population and Energy, which he gave over 1,500 times. YouTube carries a number of versions. It’s an illuminating way to spend an hour of your life. Arithmetic can be fascinating, when the storyteller is a brilliant heretic. 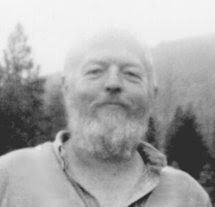 Bartlett, Albert A., The Essential Exponential!, Center for Science, Mathematics & Computer Education, University of Nebraska, Lincoln, 2004.